Clicking the Advanced tab in any of the Add Task - General windows will allow you to make many setting changes. (Work Breakdown Structure ID) is a numeric value assigned to the task based on the task's position in the hierarchy of detail for the project. The WBS may be manually assigned for each task or auto-calculated from the task list following the completion of all task entries for the project. Sets the duration for the task by calendar days, as opposed to work days. Using this option means that work assigned to the task is assigned based on a 24 hour day schedule. 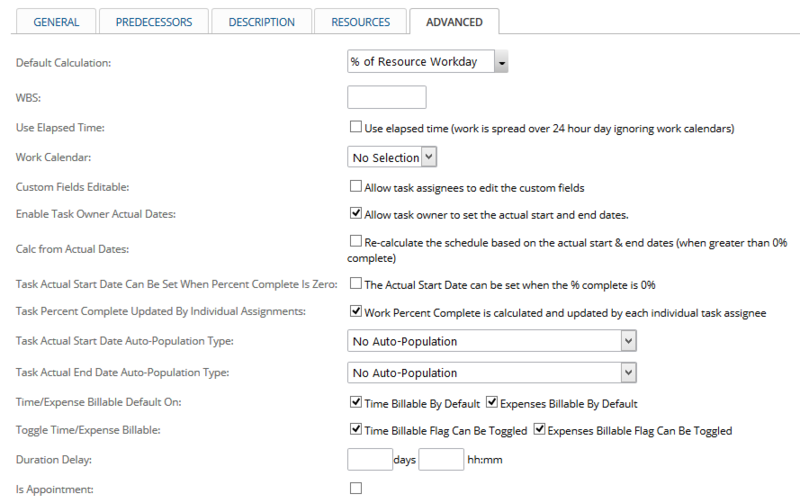 For example, a resource assigned 100% to a 1 day duration task would have 24 hours of work. Allows you to select an alternative to the default project schedule to apply to the task. If the task can only take place on Wednesdays, for example, you could create a Custom Work Schedules where Wednesday is the only working day of the week and then select it here. Allows the resources assigned to the task to edit the custom fields that have been previously created. See Custom Fields Definition Form. Allows the task owner to update the actual start and end dates on a task. Will reschedule the task based on resource or project manager updates for the actual start date. Using this option should involve careful consideration because this will very likely change the schedule for other tasks. Will allow an actual start date entry for tasks if the percent complete is still zero. Allows each resource on a single task with multiple resources assigned to independently update the percent complete of their own work. The percent complete total for the task is weighted toward the total percent complete based on the amount of work (hours) assigned to the individual. The actual start date of a task can be set to a default date if neither the task owner nor the project manager set it manually. The default setting is the scheduled start date. Manual override of the default dates is allowed unless one of the options with "...No Editing Allowed" is used. Choices for this setting are as follows. Resources must be trained as to the impact of their actions when using these options. No Auto Population will require that the dates are filled in manually. Otherwise, the dates remain null/blank. Scheduled Date will change the date to match the scheduled date upon completion. % Complete Updated Date will change the start date to match the last date that the task is changed from a percent complete of 0% to a percent complete of greater than 0%. The start time will be the default start time of the task schedule for this date. % Complete Updated Date, No Editing Allowed is the same as above without an option to change the date with a manual entry override. % Complete Updated Date & Time will change the start date and time to match the last date and time that the task is changed from a percent complete of 0% to a percent complete of greater than 0%. % Complete Updated Date & Time, No Editing Allowed is the same as above without an option to change the date with a manual entry override. Time Entry Date, when Updated will update the start date to match the date of the earliest time entry in the task. Time Entry Date, when Updated, No Editing Allowed is the same as above without an option to change the date with a manual entry override. The actual end date cannot exist unless the task is completed (100% complete). See the topic above for the Actual Start Date Auto-Population type as a reference to how these options will calculate the actual end date. Sets the billable check box as checked by default for any time and expense entries made on the task. Allows the resource to select the billable check box option when entering time and expense entries. Is a delay which is added to the total of all other scheduling formulas to move the start date for the task back a specified duration. This delay is normally the result of an automated process which has rescheduled the task. Sets a property for the task to be specifically identified by the Outlook Connector as a task which should be added to the Microsoft Outlook calendar as an appointment. Task Auto-Rescheduling Options allow for settings which will automatically delay the start date of a task, changing the task’s schedule without the interaction of a project manager. This function will be disabled after a task which is set to auto-recalculate based on the actual start and end date has a task completion greater than 0%. See Calc from Actual Dates in the options listed above. Auto-Rescheduling Type can be set to "Delay Task Until Predecessors are Marked Complete" so that when a specified amount of time has elapsed following the scheduled start date, a delay is automatically added to the task's start date. Increase Delay By sets the elapsed time which is cumulatively added to the Duration Delay whenever the recalculation interval occurs and the task's predecessors have not all been completed. This setting is only relevant with the "Delay Task Until Predecessors are Marked Complete" selected as referenced above in the "Auto-Rescheduling Type." Re-Calculate When sets the recalculation interval to a specified elapsed time following the task's current scheduled start date. This setting is only relevant with the "Delay Task Until Predecessors are Marked Complete" selected as referenced above in the "Auto-Rescheduling Type." Roll Email Notification enables a notification to be sent by email to project managers and task owners when a task has rolled. Task Splits is for setting up the time period for working on the task when a particular resource will be doing so in time periods that are separated by some period of time. For example, the task owner may be going on vacation or working off-site on a different project for a period of two days. Split Task lets you separate the periods of time during which she will be working on this particular task so that it's correctly represented on the Gantt chart. Up to five splits can be set. Starts After Duration represents the number of days of work after which the Split or "time off" begins. 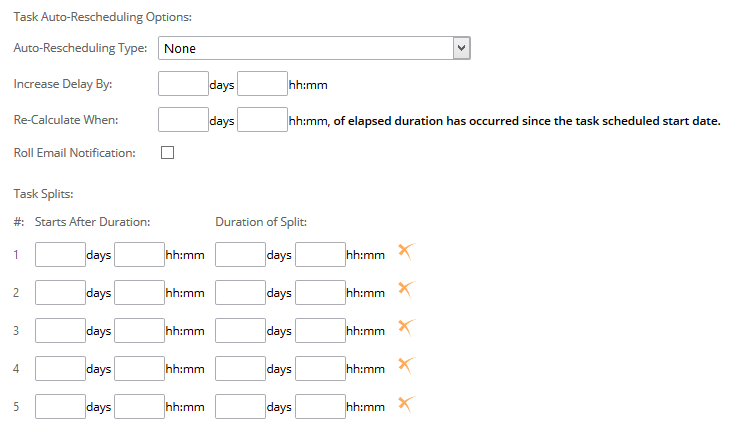 Duration of Split indicates the number of days that will not be worked for this task. Using splits can be thought of as "after x days, take x days off" from the task.